When is a lake no longer a lake? 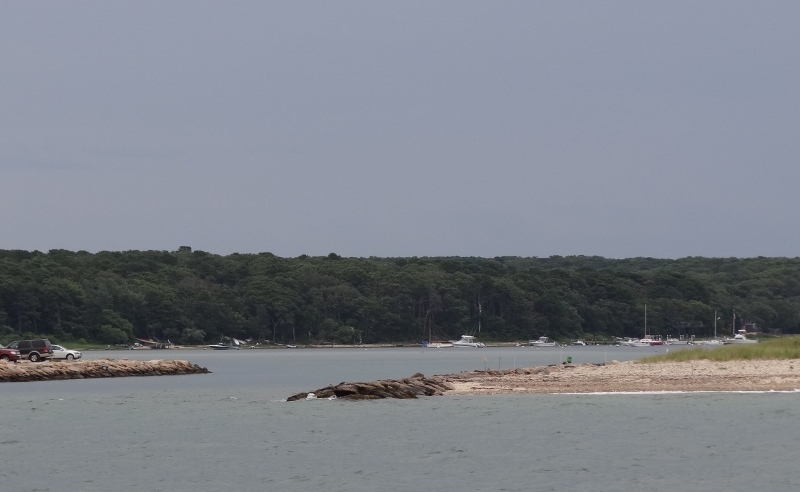 When the skinny sandy beach along Vineyard Sound is breached during a hurricane a lake quickly transforms into a quiet salt pond with room for a boatload of moorings. Surrounded by wooded hills with cedar shingle homes peeking out and many pretty moored boats, Lake Tashmoo offers plenty of anchoring room with excellent holding. 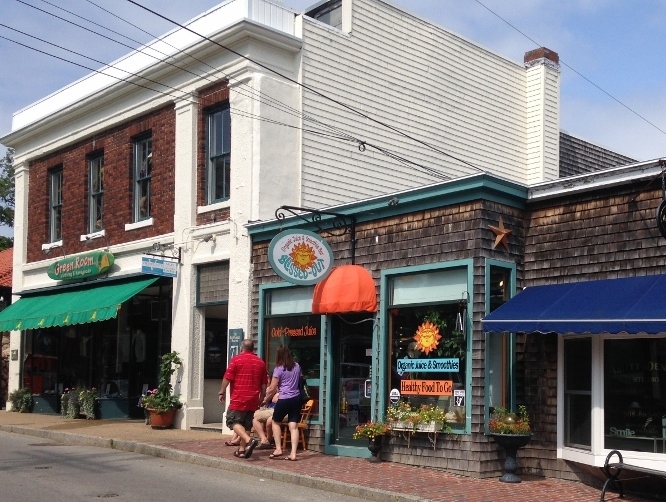 As if that wasn’t enough, Downtown Vineyard Haven is an easy one mile walk from the dinghy dock. We were completely unfamiliar with Tashmoo but our cruising buddy ActiveCaptain provided all we needed to know about this not very well-known gem. Sunday’s weather was cloudy with showers and a high temp of 71 F; not exactly a get off the boat and walk around town sort of day. Rather than spend $40 to sit aboard in Oak Bluffs, we could spend two nights in Tashmoo and Monday walk in to Vineyard Haven. Tuesday we’d head to Oak Bluffs, six miles around the corner. A couple of miles out we heard a distressing call from the captain of the 21ft cat boat s/v Julia Lee; she’d been dis-masted just outside of Lake Tashmoo entrance. 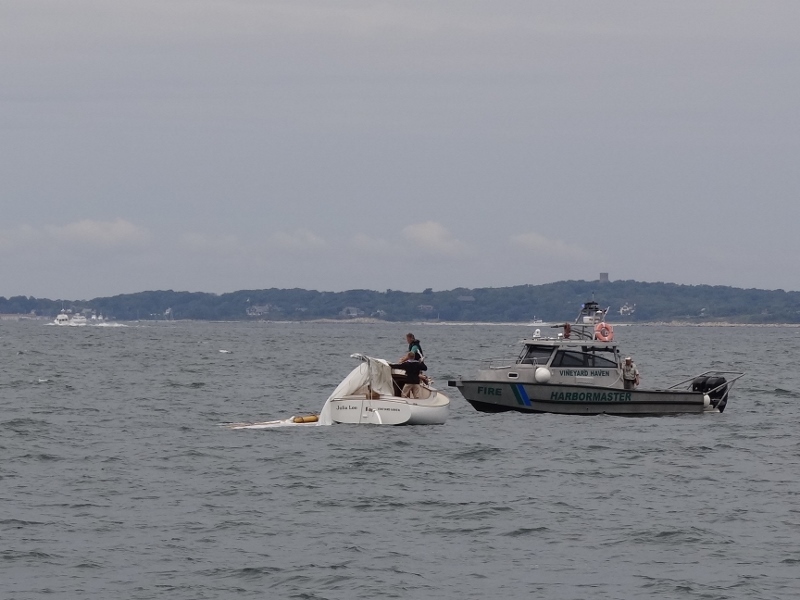 Today was not a windy day; 8-12kts. 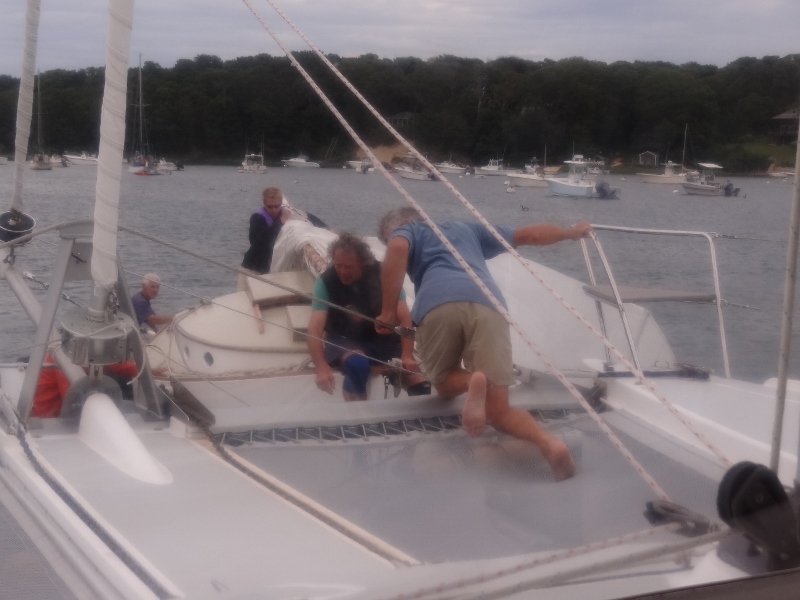 In the process of getting Julia Lee off the hip tow and on to a mooring, she found her way right into our bows, slowly, as cats will do to check out another cat. We’d anchored in a perfect spot to watch this all unfold. 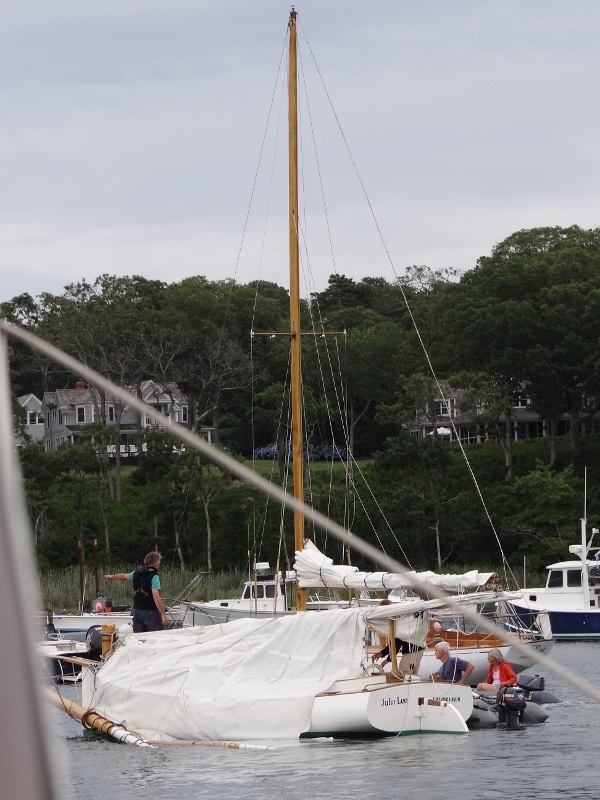 The mast snapped off about eight inches above the boom and the wood looked fresh- no ugly wood rot discoloration. Never did find out the cause. Now Russ had to really push. No damage. No wind, just all in slow mo. 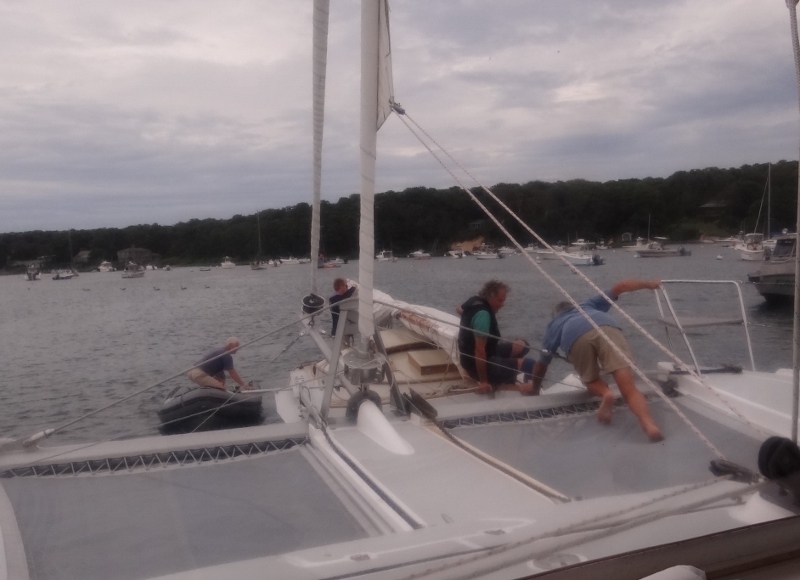 After the neighbors finished helping out one approaches our stern and asks if this is a Maine Cat. Maybe we should have taken that Maine Cat brochure from Cuttyhunk! He accepts our invitation to come aboard, but later and brings a friend. So the friend steps aboard and says to me, “where’s your Cuttyhunk tee-shirt?” Today was not my very bright day so I stumbled and sputtered out words that indicated that I’d recently bought one. But what he was really saying was that we’d met in Exuma Market, George Town, Bahamas because I was wearing a Cuttyhunk t-shirt (I realize I have more of these than any other place) and he being from (I think) Falmouth area, how could you not comment? Paul, yes I did remember the entire event but didn’t recognize him; been seven months you know. Our shrinking world has become so small. Monday managed to be slightly warmer with a high of 75F once the sun chased away most of the morning’s clouds. July has been very pleasant with precious few hot days and a bit cooler on the islands than inland I imagine. 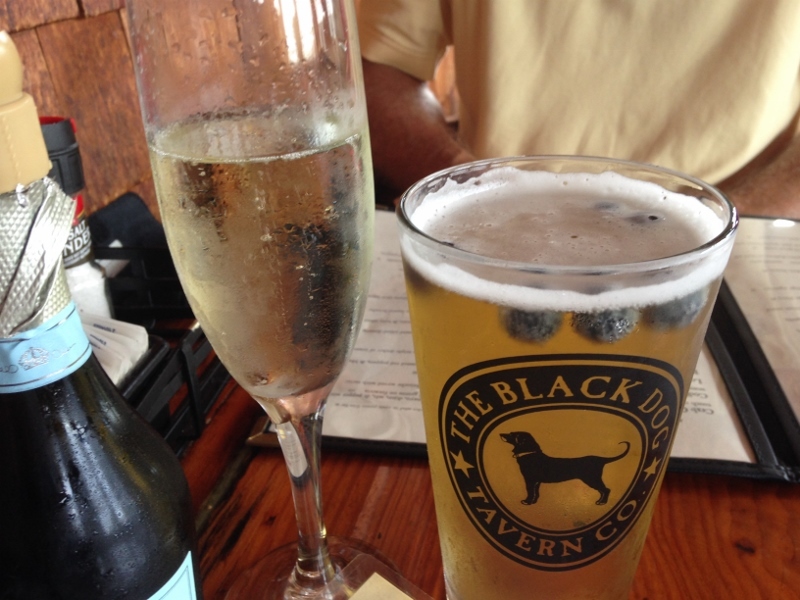 I got a substantial shopping fix and we partook of lunch at the popular Black Dog Tavern. A pleasant surprise to discover that Vineyard Haven is no longer dry; not dripping wet like Oak Bluffs or Edgartown, but let’s call it moist. Restaurants can serve beer or wine (or drinks made from such) with a meal; an excellent compromise. I added a LS Black Dog tee to my collection for the first time in many years because they’ve not been as well made as in earlier years. This one caught my eye and then when I read the tag’s description, “LS Black Tashmoo Tee” that clinched it. I mean we’d never heard of Tashmoo before and now it’s all over the place! The real Black Dog lived in Vineyard Haven as a companion to Captain Robert S. Douglas. In the early 1960s, Douglas retired from his career as a fighter pilot and returned to MV where he’d sailed in his youth. He designed and commissioned a 108-foot schooner and had her built in Maine. He sailed the black-hulled Shenandoah to Vineyard Haven and began taking passengers for sails. His dog, a lab-boxer mix named “Black Dog” was always at his side. Apparently Captain Douglas was dismayed that no year-round restaurants existed in Vineyard Haven and soon acquired beachfront property. In 1971 he opened the now-famous Black Dog Tavern and the rest is history. 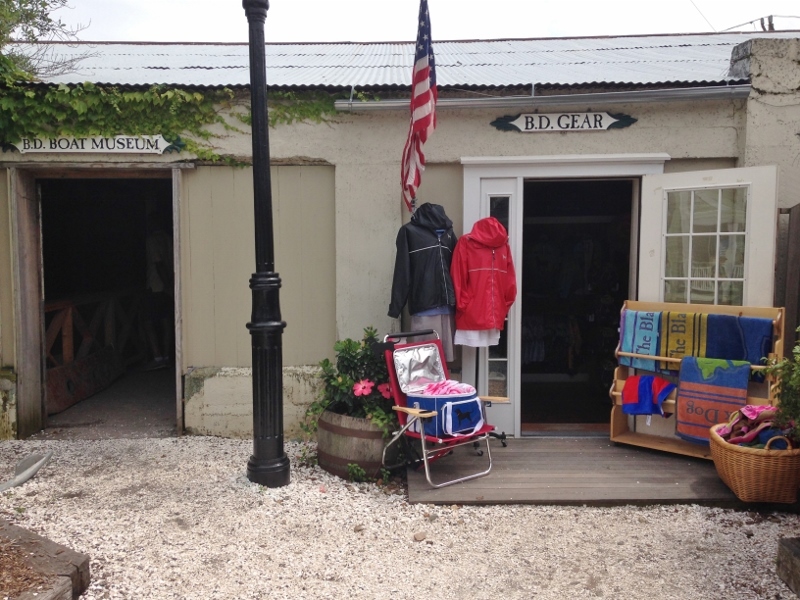 The Black Dog T-shirts which were created originally for restaurant staff, became such a cult item that you can’t turn around on the Vineyard without walking into a clothing store or bakery. We noticed several more locations even since our visit last year. Below is one of our favorite photos. I can’t speak for our son though! 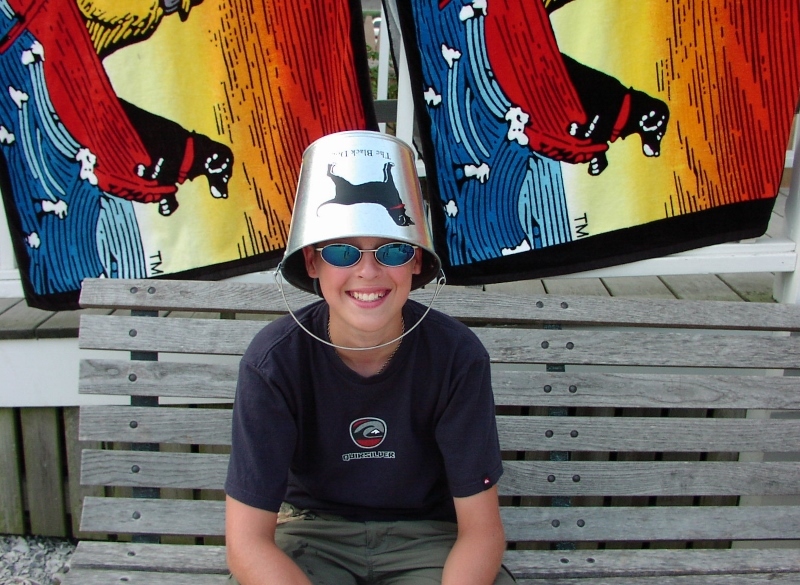 All this reminiscing about the Vineyard got me thinking that maybe this photo was digital and it was. 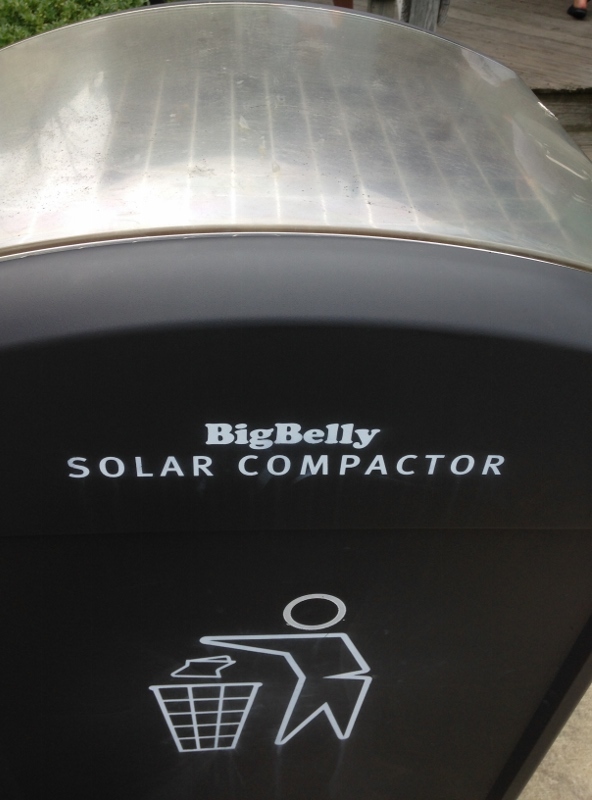 The Big Belly with solar panel on top. Vineyard Haven is home to the second largest fleet of wooden boats on the East Coast; only Rockland Maine has more (we’ll check out that claim next month). Ice Cream at Mad Martha’s was an afternoon treat and as we sat savoring a small dish we noticed the solar trash compactors; how clever. 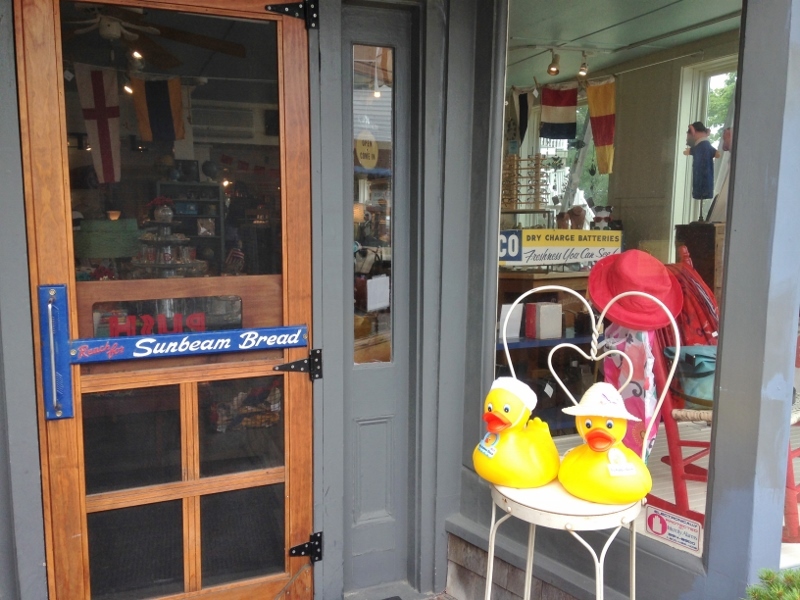 They are scattered throughout Vineyard Haven. Deposit your garbage as if you were mailing a letter and the unit does the rest. Woody- think we’re all going to be thrilled to have “the rest of the story”! !